(Clearwisdom.net) The annual festival season has arrived again. 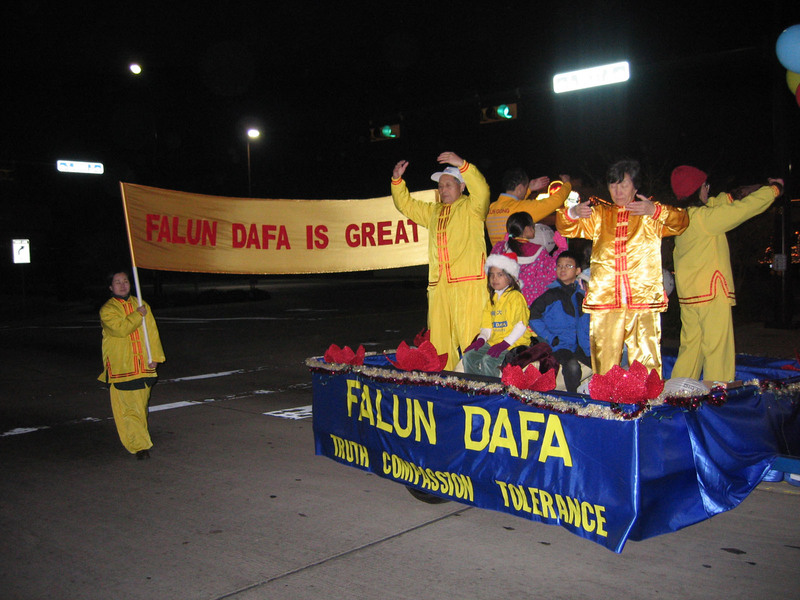 Falun Gong practitioners in Dallas, Texas got the approval to participate in Arlington's Christmas Lantern Parade. 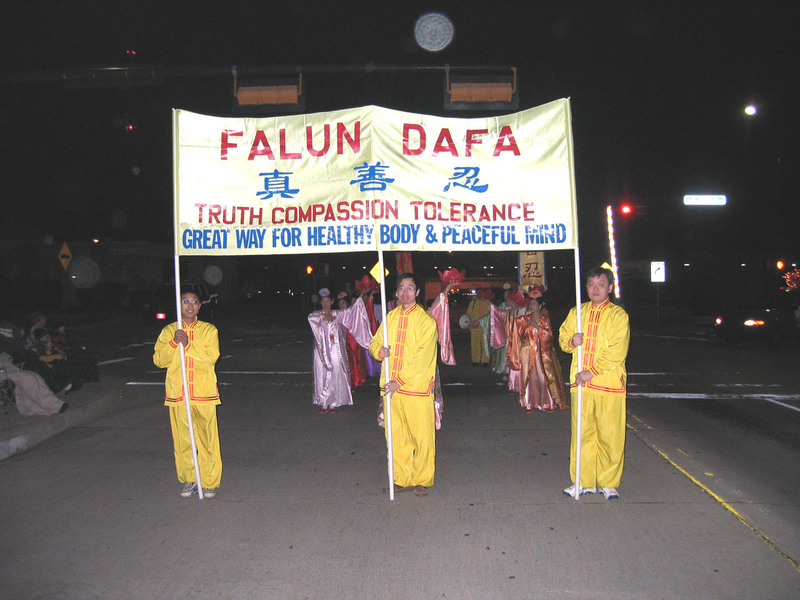 Dallas Falun Gong practitioners and local practitioners in Arlington have held several Falun Gong study sessions and Fa-promoting activities in various ways, and the Arlington government has given them awards several times. During the evening of December 6, Falun Gong practitioners gathered in Arlington to display to the local people the good demeanor of Falun Gong practitioners and wonderfulness of Falun Dafa. 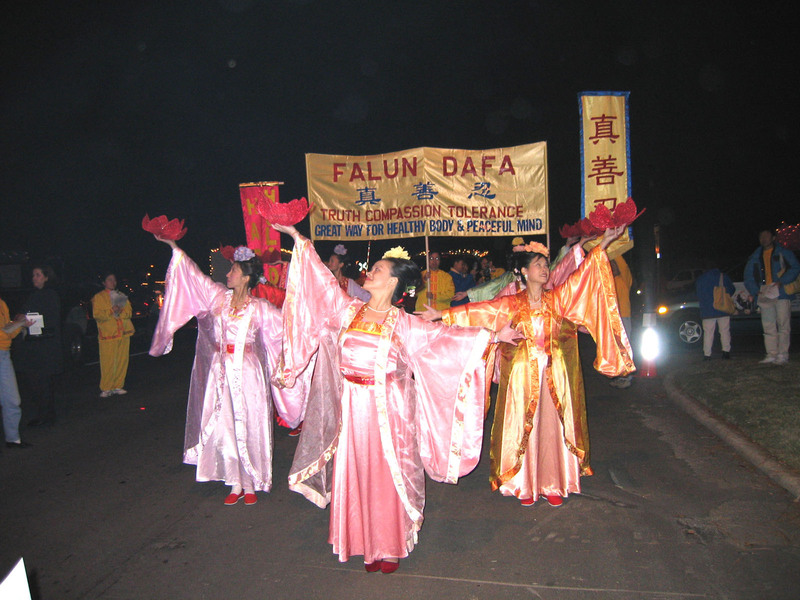 The Falun Gong contingent was the only group with an Asian theme among the dozens of lantern groups. The beautiful lotus dancing attracted the attention of many people lining the street. Colorful banners that read, "Truthfulness-Compassion-Forbearance" and "Happy Festival" expressed practitioners' best wishes for local people. A float decorated with colorful lanterns and practitioners who were demonstrating the exercises on the float were also the focus of this procession. Wherever Falun Gong's float went, applause and acclamations could be heard. Falun Gong practitioners handed out flyers to introduce Falun Gong to local people. In the end, the Falun Gong contingent won a "Jingle Bell Award."